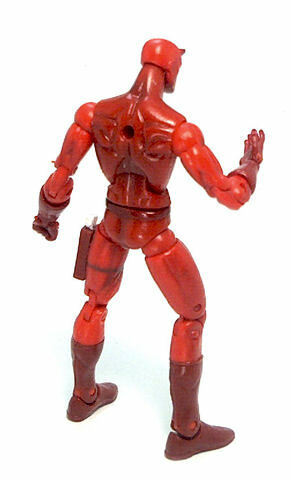 Although Hasbro seems to be doing rather well nowadays with their Marvel Universe figures, they were not the first ones to make 1:18 scale Marvel characters. 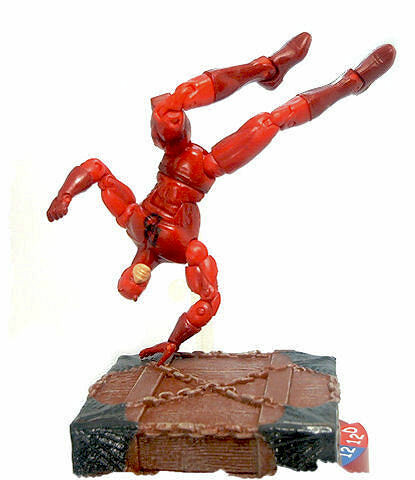 Back in 2005, Toy Biz launched their Marvel Superhero Showdown line (later renamed as Marvel Legends Showdown), which would run only two years before the license was transferred to Hasbro. Up to that time Toy Biz’s main line was the 6-inch scale Marvel Legends and the 3.75-inch scale Showdown figures were seen as something of a novelty because of the tabletop game associated with them. The game mechanics were somewhat convoluted and involved spring loaded launchers, flying bases with stats printed on them, die, a few Skill cards for each character in play and larger Location cards that conformed the playing field. Overall the game was entertaining to play, although not terribly deep in terms of tactics. 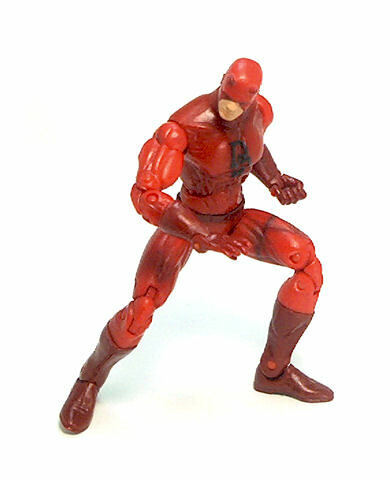 One of the last wave characters made was Daredevil. 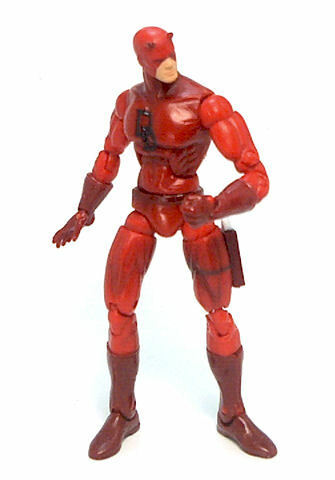 Like the other characters in the line, Daredevil was uniquely sculpted (as opposed to Hasbro’s use of generic blank bodies). 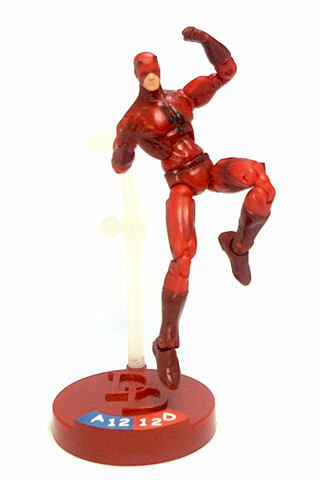 This articulation model can be considered overkill due to the redundant joint design (which in some other characters did affect figure stability), but on Daredevil each and every joint works just fine and is stiff enough to hold any pose. 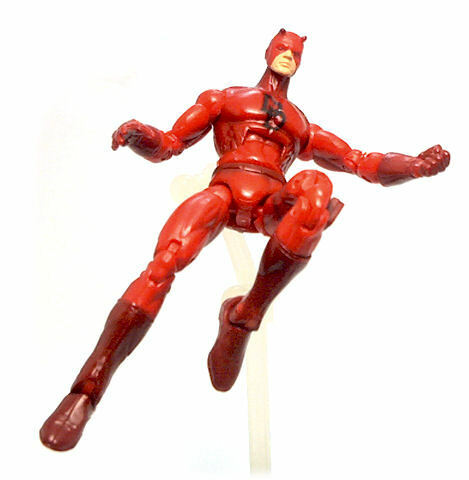 The paint operations on Daredevil were kept to a minimum by having most of the pieces cast in the appropriate plastic color (bright red for the costume and darker hue for gloves and boots), with only a few block paint applications and airbrushed shadows added for effect. As mentioned, the figure came with a round, character-specific display base, a clip-on projectile launcher, die and a handful of playing cards. Out of these, the base is possibly the most useful item to have, as it includes a white articulated arm that allows for multiple posing options. 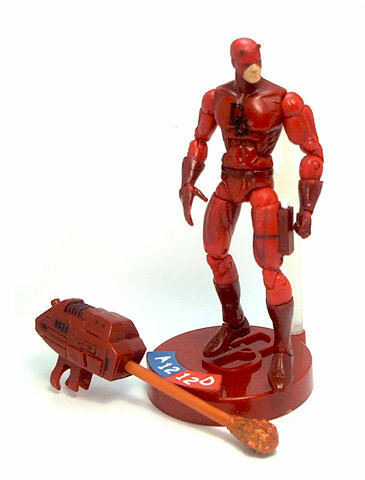 On the whole, Daredevil is among the best figures produced in this line, and one I’d recommend to track down over the later Marvel Universe release.